The transformation of "depressed" North London areas promised soon after the last year riots is apparently going to happen, but in the a questionable way. 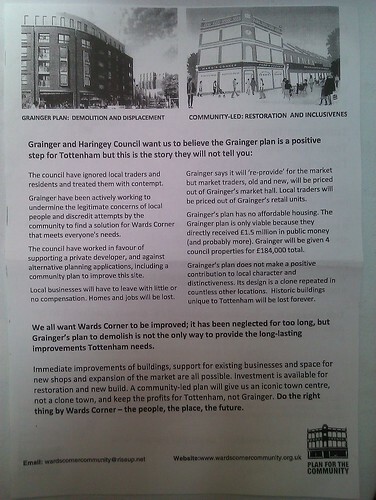 Plans were presented for Lea Valley, Seven Sisters, White Hart Lane, etc. all of them boasting glossy photos (or more precisely, smooth rendered images) and offering some some different experience for everyone. Some of the projects have longer history (e.g. Wards Corner restoration has been a debated issue for several years), some were were introduced during the last year only and have already changed their developers, but there is still a progress to observe. I find these arguments valid, but at the same time can't fully agree. I hate big retail centres with identical shops and chain restaurants, and well, not because they "lack their own face". I actually more enjoy, say, buying clothes in bigger stores - the less interaction, the better (doesn't apply to food though, and there is Amazon for everything else). The real problem with mass retail is that one day you realise most of the staff they employ actually hate being there and either hope it's (and you're) being only a short stop on their way to something more decent or live under permanent stress of fines, low wages, rude customers and no perspective. On the other hand, it's hard to argue that cafes and small stores currently open at Wards Corner are not the cleanest or safest ones, and being honest I wouldn't go there myself. I wouldn't use them as a good small business examples either - they change owners and signs fairly often, and those signs are cheap and don't reveal the best taste. Back of that "own face" problem leaflet is focusing on, despite all these facts, you can still claim that some of them can only exist there (not the prettiest or most friendly face though), while residential towers and retails centres can be erected absolutely anywhere and be as absolutely identical. And most importantly they aren't going to accommodate those who live and work there now. The "restoration" is, effectively, not about helping businesses and people to become better off. It is, in a longer perspective, more about replacing them.